Sensor Measurement Solutions - Robert Owen Inc.
A US manufacturer of Sensor Signal Conditioning and Sensor Measurement Systems. Products include: PLC compatible 4-20mA sensor transmitters, PC compatible USB sensor converters and wireless (RF) sensor converters. 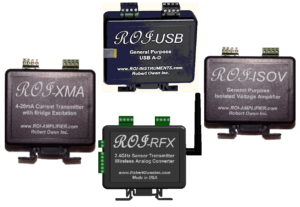 Products for remote sensor telemetry monitoring, & recording. 4-20mA transmitter signal conditioners compatible with Thermistor & RTD temperature sensors, potentiometer level & position sensors, and more. Robert Owen manufactures Sensor Measurement Solutions Made in the USA. Products include: PLC compatible 4-20mA sensor transmitters, PC compatible USB sensor converters and wireless (RF) sensor converters. Products for remote sensor telemetry monitoring, & recording. 4-20mA transmitter signal conditioners compatible with Thermistor & RTD temperature sensors. Potentiometer, level, & position sensor conditioning, and more. Specialists in sensor signal conditioning. Made in the USA, Shipping Worldwide. With our ROI-XMA, ROI-USB, & ROI-RFX & ROI-ISOV10 products; we offer the components that make sensor measurement simple. DIN rail and surface mounted packages. Many ranges from our standard products are possible, as well as customized solutions. This is a good point to look our online catalog. Would you like to take a look at our capabilities?